Posted June 30, 2010 by Paddy Tobin in News. The Claregalway area has benefitted from significant population growth in recent years. With this growth has come the need for many services including a very urgent necessity for a second-level school. The need for a school in Claregalway was recognised in a report published by the Department of Education in 2007. The Dept identified the requirement for a 600-pupil school in Claregalway circa 2016. 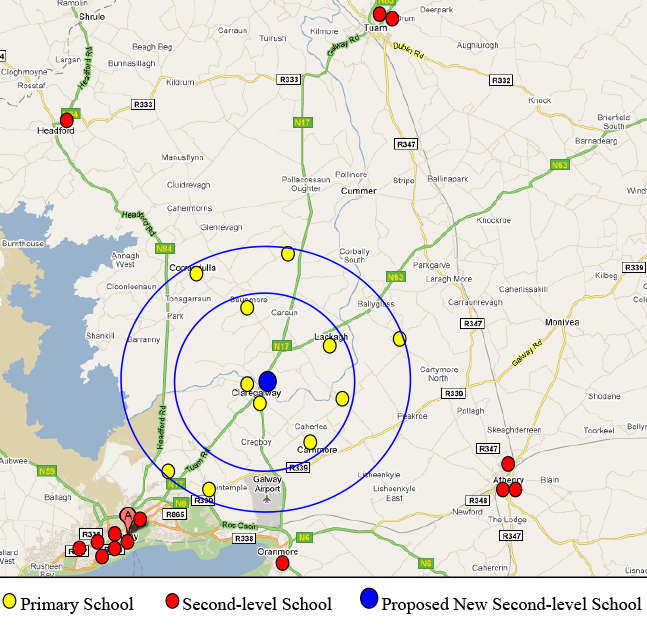 The map above shows the Claregalway area, the location of the current primary and second-level schools, and a possible location for a new school. It is clear from the map that Claregalway (now a significant population centre) is at the heart of region where children journey outwards to reach second-level schools some distance away. There are currently 1100 children enrolled in six primary schools within 3–4 miles of Claregalway. There are five more schools with another 800 children within 5–6 miles of Claregalway. Conservative estimates of progression to a new second-level school easily surpass the Dept recommendation of a 600-pupil school. Unfortunately, with a burgeoning primary school population already at 1900 children, the new school is needed immediately, not in six or seven year’s time. To make matters worse, population pressure in recent years on second-level schools in Oranmore, Athenry and Galway City has edged Claregalway out into almost peripheral status, and many families simply cannot get school places for their children. Some quick-thinking and action is needed to diffuse this current crisis in the availability of schools places. Logically, in order for 600 children and their families to take advantage of a state-of-the-art new school in 2016, enrolment in an interim school building should really begin in September 2011. This would grow student numbers year-on-year to 600 by 2016 in line with the Dept recommendation. Already some innovative solutions for interim school accommodation have been proposed, and a September 2011 enrolment would begin to ease the pressure on the surrounding second-level schools. Parents of children in primary schools in the Claregalway area, working with Frank Fahey TD and other public representatives, have already brought a proposal to the Minister for Education. They are seeking the immediate commencement of the new school recognition process and establishment of an interim secondary school in Claregalway next year. The group have conducted extensive research and, with the support of the primary school principals, gathered a substantial number of written endorsements from parents throughout the area. They have also held a very well-attended and successful public meeting to discuss the initiative and raise public awareness. Full support for the initiative has been given by all County Councillors, Senators and TD’s associated with the area. A delegation of parents will be meeting with the Minister for Education in the first week of July to present the case and seek agreement on action. Download an endorsement form here: Claregalway Secondary School endorsement form—June 2010.